Colors: Black, Slate, Gray, Brindle, Fawn, Bronze, spotted or slid. 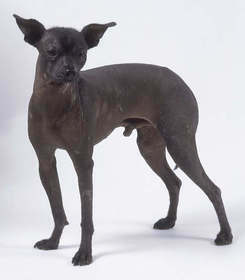 The Mexican hairless is one of the oldest dog breeds in the world they fall in the unique category of breeds that had been developed around 3000 years. This world class breed is known for it's magical and unique strength. They are useful as bed warmers and are known to be blessed. They are also known as the respected champions. The thing which makes this breed unique is their upright big and bat-like ears which enables this breed to be very eager at hearing. This breed is extremely good having tough legs and a graceful personality. The Mexican hairless breed is intelligent and protective and very good for their family. This breed is not suggested for those who do not have any experience of handling a dog. The Mexican hairless dog breed usually does not bark they yowl to inform their family about dangers. They are good in homes and do well with children. The Mexican Hairless dog breed have a violent approach towards dogs or pets that they don’t know and are not familiar with. They need extra concentration from their owners towards them because of their demanding nature. They become critical if they are left alone for some time and will show a anxious behavior if they become harassed. The Mexican hairless are a very sensitive breed and they don't like cold weather and need a blanket in cold weather because of their sensitive skin, so it is essential to protect the mexican hairless from such extreme climates. Because of its sensitive skin it is advisable to only bathe this breed when necessary,otherwise bathing can harm the skin of this dog breed. It is also very important to apply a lotion and sun protector on the hair less skin but remember too much lotion and sun protector can cause acne in this breed of dogs. This breed is also present in the coated variety which needs minimal brushing.The Mexican Breed is generally come in two different types one is which have coated and other one which is hairless. The hair less breed only has a little amount of hair on its tail and head. Their skin is very soft, clear and beautiful. Whereas the coated type has a full coat of hair on their skin which is soft silky and lustrous. This breed needs very early socialization and training. They are good learners but they need a good trainer too it is very important that training should done with determination and on regular basis they show lots of respect to their owner and are a very obedient dog breed. The Mexican Hairless are recommended as a good city dog who do well in city and in apartments, they love to go on walks and take sunbath during the outdoor activity. It is very important to keep the Mexican hairless out of extreme cold as well as extreme sun because of its sensitive skin. The Mexican hairless dog breed is generally known to be a hardy breed of dogs free from many health problems and dog diseases, but it is known to be affected by early tooth loss, allergies to food and skin infection.